The Egg Safety Center has a complete list of recalled eggs, their expiration dates, and brands. Check the situation in your state. Here are safety tips. (CNN) -- The number of eggs recalled in a nationwide salmonella scare has grown to more than half a billion. Iowa egg producer Hillandale Farms of Iowa is voluntarily recalling some 170.4 million eggs distributed to stores and companies that service, or are located in, 14 states, a spokeswoman at the Egg Safety Center said on Friday. The Hillandale eggs were distributed under the Hillandale Farms, Sunny Farms, and Sunny Meadow brand names in six-egg cartons, dozen-egg cartons, 18-egg cartons, 30-egg packages, and five-dozen-egg cases, the website for the Egg Safety Center said. Loose eggs, which could be repackaged by customers, were packaged under the Wholesome Farms and West Creek brands in 15- and 30-dozen tray packs, according to the Egg Safety Center. The eggs affected by this recall either have plant number P1860 with date codes ranging from 099 to 230, or plant number P1663 and date codes ranging from 137 to 230, the website said. The salmonella outbreak prompted Wright County Egg of Galt, Iowa, which began recalling eggs last week, to increase its recall to 380 million eggs on Wednesday. The number of salmonella cases is expected to grow because infections after July 17 may not have been reported yet due to a two- to three-week lag between when a person becomes sick and when the case gets reported in the system, the CDC said. "The outbreak could have been prevented." McGarry said. "The egg safety rule is in a phase-in approach, but there are measures that would have been in place that could have prevented this if it [had] been placed earlier than in July." 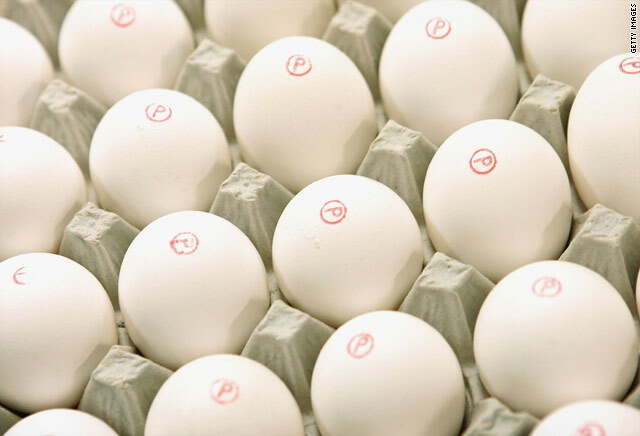 The FDA's new rules cover refrigeration of stored and transported eggs, pasteurization, rodent control, cleanliness and they require a written Salmonella enteritidis prevention plan. The agency said "implementing the preventive measures would reduce the number of Salmonella enteritidis infections from eggs by nearly 60 percent." Animal welfare groups have criticized conditions of farms operated by Wright County Egg, including the Maine Contract Farming facility in Turner, Maine. Mercy for Animals, a nonprofit animal welfare group, conducted an undercover video investigation of the farm in 2009, and forwarded its findings to Maine animal welfare officials. Jack DeCoster, who leads Wright County Egg, in June pleaded guilty to 10 civil counts of animal cruelty over his company's treatment of its chickens, said Dr. Donald E. Hoenig, state veterinarian. DeCoster and his company agreed to a $25,000 fine and made a $100,000 payment to reimburse the state for future monitoring of the facility. Allegations included too many birds in case, injured chickens not being treated, dead animals not being promptly removed from cages and improper euthanization, Hoenig told CNN. "Since then, the company ... has followed all of our requirements," he said. "It's no surprise that these birds that are crammed together, basically defacating on top of other birds," said Dan Hauff, director of investigations for Mercy for Animals. "It's no surprise that this is the outcome, this type of outbreak." Krista Eberle, director of food safety programs at the Egg Safety Center, which is run by United Egg Producers, a cooperative of U.S. egg farmers, reiterated that only shell eggs are affected by the Wright County recall. Country Eggs, Inc. on Thursday said it is voluntary recalling specifically-dated shell eggs produced by Wright County Egg. Eggs were distributed to food wholesalers, distribution centers and food-service companies in California, Arizona and Nevada, according to a statement. Eggs were packaged under the Country Eggs, Inc. brand name in 15 dozen bulk pack with the identifying plant code of P 1946 and P 1026. Julian date codes are 216-221. Dates and codes can be found on the box label. In addition, NuCal Foods, which, on its website, calls itself the largest distributor of shell eggs in the western United States, announced Thursday it was "voluntarily recalling specific ... dates of shell eggs produced by Wright County Egg and packaged by NuCal Foods because they have the potential to be contaminated with Salmonella." Wednesday's recall covers eggs branded as Albertsons, Farm Fresh, James Farms, Glenview, Mountain Dairy, Ralph's, Boomsma, Lund, Kemps and Pacific Coast and are marked with a three-digit code ranging from 136 to 229 and plant numbers1720 and 1942, the company said.